Roodepoort, meaning “red valley” in Afrikaans, is a sprawling residential area, in parts dominated by light industry and small businesses. It gets its name from the red soil in the area. It dates back to 1884, when Fred Struben discovered the first payable gold in the area at what he called the Confidence Reef, a large rocky outcrop in the centre of Roodepoort. At the time the area was settled by scattered Boer farmers on nine farms. Four of the farms – Roodepoort, Vogelstruisfontein, Paardekraal and Wilgrespruit – were soon declared public diggings. The city of Roodepoort originated when Jan Bantjies secured the prospecting rights on the farm Roodepoort. Gold was discovered the following year and the farm was declared open for public diggings. Other discoveries followed and as the diggers needed a place to pitch their tents, the farm Roodepoort opened up its land. A shantytown sprang up. Between 1886 and 1888, four mining towns, Roodepoort, Florida, Hamberg and Maraisburg, were proclaimed. The Goldfields Diggers Committee was formed in 1886 to represent the farmers’ interests. This was the first form of local government in the area, which became known as Roodepoort-Maraisburg. The search for gold spread, and in 1886 the main reef at Langlaagte in Johannesburg was discovered. The gold at Confidence Reef, mostly surface gold in quartz rock, soon ran out, but by then a settled community was established in Roodepoort. In 1903 the Roodepoort-Maraisburg Urban District Board was established, and the first election was held in January 1904. The status of the Board was soon raised to that of a municipality, and in 1963 the Roodepoort-Maraisburg municipality was changed to Roodepoort and city status was granted in 1977 (at which time Maraisburg was dropped from the name). Roodepoort is a gold-mining center in the West Rand area. A monument commemorates the Jameson Raid of 1895. The city retains some of its early historic buildings. The Old House on the corner of 3rd Street and Boundary Road consists of an early three-roomed wood and iron structure, which soon had a veranda and railing added to become an attractive cottage. The old municipal offices in Berlandina Street, an attractive plaster and stone building now used as a Roodepoort branch library, were declared a national monument in 1985. Another national monument is the old Roodepoort Town School in Rex Street, on the site of the original building erected in 1894. Made up primarily of the Greater Roodepoort area, this region now contains residential suburbs, agricultural holdings in the north, part of the mining belt in the south, and some areas of commercial activity such as Westgate, Constantia and Laser Park. The Roodepoort region is one of the most attractive residential areas in Johannesburg, offering charming suburbs amid rolling hills, many with superb views of the city to the east and the Magaliesburg to the west. There are plenty of open spaces, golf courses and entertainment areas, as well as what many consider the city’s finest park, the Witwatersrand Botanical Gardens. Although the area is far to the west of the city centre, well-marked dual-carriage highways offer excellent transport routes. Roodepoort is the region most conveniently situated for access to Gauteng attractions such as the Cradle of Humankind, Magaliesburg and Pilanesburg. Character: Predominantly residential with supporting urban amenities. Increasing numbers of people are being housed in unhealthy and exploitative circumstances on the Princess AH through “shack farming”. Suburbs in Region 5: Aanwins AH, Allen’s Nek, Alsef AH, Amorosa AH, Bergbron, Carenvale, Consolidated Main Reef Gold Mine, Constantia Kloof, Constantia Park, Creswell Park, Davidsonville, Delarey, Discovery, Doornkop AH, Durban Roodepoort Deep, Fleurhof, Floracliffe, Florida, Florida Glen, Florida Hills, Florida Lake, Florida Lakes, Florida North, Florida Park, Georginia, Groblerpark, Groblerpark Ext, Hamberg, Harveston AH, Haylon Hills AH, Helderkruin, Hillfox, Honey Hills, Honeydew, Horison, Horison Park, Horison View, Industria North, Kimbult AH, Kloofendal, Lindhaven, Little Falls, Manufacta, Maraisburg, Matholesville, Northcliff Ext, Ondekkerspark, Panorama, Poortview AH, Princess, Princess AH, Quellerina, Radiokop, Rand Leases Gold Mine, Reefhaven, Rietfontein AH, Robertville, Roodekrans, Roodepoort Central, Roodepoort North, Roodepoort West, Ruimsig AH, Selwyn, South Roodepoort Main Reef Areas Gold Mine, Stormill, Strubensvallei, Tres Jolie AH, Uitsig, Weltevreden Park, White Ridge, Wilfordon, Wilgeheuwel, Wilropark, Witpoortjie. 30 September 1979 – Azapo (Azanian People’s Organisation) is established in Roodepoort for the second time, after the first founding in 1977 did not succeed. The first president is Curtis Nkondo. (Wallis: Nuusdagboek). 14 May 1997 – Three learners of Die Adelaar high school in Roodepoort win an international internet competition in which more than 20 000 learners from thirty-seven countries competed. (Wallis, F. (2000). Nuusdagboek: feite en fratse oor 1000 jaar, Kaapstad: Human & Rousseau). Roodepoort (1963-1994) Roodepoort is located to the west of Johannesburg and is part of the Witwatersrand conurbation (known colloquially as the West Rand). The town owes its origin to the discovery of gold and although the diggings were not as profitable as elsewhere on the Witwatersrand, Roodepoort was established as a municipality in 1903 and became a city in 1977. Following the re-organisation of local government in South Africa in 1994, Roodepoort is no longer a separate municipality and in December 2000 became part of the Greater Johannesburg Metropolitan Municipality. The flag of Roodepoort, adopted during its Diamond Jubilee celebrations in 1963, was in the predominant colours of its municipal arms and had the shield in the canton. The remainder of the flag comprised four alternating �L� shaped bands in the fly of green and red fimbriated in yellow in the fly and uniting without the fimbriation at the bottom of the flag. ARMS: Vert, a swan Argent swimming on a base wavy Argent and two bars wavy Azure; on a chief per pale, I. Gules, two gold mining hammers crossed in saltire; II. Or, a quatrefoil Vert CREST: A mural crown Or, masoned Sable WREATH AND MANTLING: Or and Vert SUPPORTERS: On a grassy mount Vert, dexter a blesbok; sinister a springbok, both proper MOTTO: QUATTUOR IN UNO (Four in One). 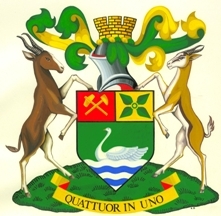 Several local school submitted designs in response to a competition organised by the municipality and these were submitted to a heraldic authority, Mr Mitford-Barberton, in Cape Town. None of these designs were considered heraldically correct and accordingly Mr Mitford-Barberton was commissioned to design a flag, which was taken into use in October 1963. The crossed mining hammers symbolise the contribution of the gold mining industry to the growth of the town while the four leafed clover represents the four mining towns (Maraisburg, Hamberg, Florida and Roodepoort) which merged to become one city. The swan is a reminder of the gift of twelve swans from the Royal Swannery in Cookham-on-Thames presented to the municipality by King George V after his visit to the town in 1936. FLORIDA LAKE Catering for a wide variety of recreational tastes, Florida Lake has understandably become Roodepoort’s most popular park. There are masses of waterfowl on the lake and the adjacent bird sanctuary ensures that bird watching in this area is good. The atmosphere on weekends and public holidays is festive and there are a number of lapas available for group functions. There is a super putt-putt course, an Olympic sized swimming pool and an adventure park for the kids. The lake is situated in suburban Roodepoort and has a number of flats looking out over the water. Florida Lake hosted Gauteng´s sixth annual dragon boat festival in 2004. KLOOFENDAL NATURE RESERVE This reserve in the North-Western Highveld is home to 120 bird species and indigenous trees like proteas, orchids and other flora, and includes an attractive rocky koppie. A stone amphitheatre on the western edge is used for open-air events, and two circular walking trails take visitors past the old Confidence Reef gold-mine shaft (now restored as a national monument), a small dam, and various sites of geological and botanical interest. The air is filled with the songs of more than 120 recorded bird species. Over 120 dassies were released into the Kloofendal Nature Reserve, mainly to supply food for the black eagles that live in the nearby Witwatersrand Botanical Gardens. In time Kloofendal is to get blesbok, black wildebeest, zebra and a pair of duikers. This reserve is an area of approximately 50 hectares situated north of Horizon and west of Christiaan De Wet Road in Roodepoort. In 1972 the City Council reserved this land for a festival park with an amphitheatre and picnic facilities at the main entrance, and a nature conservation area over the remainder of the reserve. The latter is protected wilderness area. The reserve is situated on the quartzite and shale rocks of the Lower Witwatersrand system. These sediments lie on rocks more than 3000 million years old. The area is bounded on its northern and southern borders by ridges of hard light-coloured quartzite separated by a valley of softer reddish shale. Dependant upon the soil types derived from these rocks, different types of vegetation are found. Other factors affecting the kind of plant life are the temperature, amount of rainfall and the protection offered by the southern ridges. All trees and shrubs in the reserve are indigenously South Africa. The reserve is still under development and, according to City Parks, the area´s importance lies in its environmental education and eco-tourism potential. WALTER SISULU BOTANICAL GARDENS It consists of around 300 hectares of landscaped and natural veld areas, planted with only indigenous trees, 600 species of indigenous flowering plants and shrubs. Over 230 species of birds have been recorded in the Garden as well as a number of reptiles and small mammals. The Garden, donated to the people of Roodepoort in 1982 by the farmer who owned the property, is crisscrossed with trails, one going to the top of one of two small mountains that overlook a waterfall and the eagles’ nests. Other walks take the visitor past the wild flower garden, a fern walk, a forest walk along the spruit, or a walk down to one of three dams on wheelchair-friendly brick and wood paths, to sit in the hide to watch the water birds. There’s more – an arboretum with shady lawns, a water-wise demonstration garden, acres of green lawns, a cycad garden, a magico-medicinal garden (plants used for magical and medicinal purposes), a succulent garden, and environmental education. The Botanical Garden is a people place. It has a busy programme of events throughout the year. These include a spring plant fair, with thousands of indigenous plants on sale; picnic concerts throughout winter, featuring a variety of light classical and jazz performances on alternate Sunday afternoons; stargazing in early September and October, and a solar eclipse breakfast in early December; a teddy bear’s picnic in early October; a clivia display in September; and carols by candlelight in December. The Garden also boasts a restaurant, the Café Clivia, under two stinkwood trees and alongside a water garden with a series of ponds and water-loving plants; the Random Harvest Indigenous Nursery, with a variety of plants on sale at reasonable prices; and a curio shop. There are a number of ongoing projects to maintain the excellence of the park. Control of alien invasive plants, especially along the streams that run through the park, is ongoing and labour-intensive; the continued fencing of the park, especially with the acquisition of more land; maintenance of walkways and trails; and further educational signage and labelling of plants and trees. The Garden has big plans for the future, including a conservatory and display glasshouse to house plants from other regions in the country; a concert stage; a climate garden illustrating various aspects of climate and how it affects plants; a wildlife-friendly garden demonstrating how to attract birds and other plant life into the garden; a geological garden displaying geological diversity of the region by means of boulders of different rock types; and a fragrance garden linking to the magico-medicinal garden, particularly planned for the blind and poorly-sighted. The Garden has a special programme for the Summit, including an “Africa’s plants & people” exhibition and lecture series; a Sunday picnic concert featuring the Buskaid Soweto String Project; and a clivia display, as well as various activities for children. This is an ideal place for family outings and also bird lovers. A breeding pair of Black eagles make the news headlines quite regularly! If you don’t have the energy to walk to the top of the waterfall and look down on one of the Black Eagles’ nests, stop at the thatched entrance hut: there’s a webcam focused on the nest, and you can get an eagle’s eye view of it. ROODEPOORT COUNTRY CLUB Nestling in the tranquil countryside of Ruimsig, west of Johannesburg, lies one of South Africa’s most challenging championship golf courses, Roodepoort Country Club. It is well known and recognised that condition-wise the course is consistently among the top 10 in South Africa. The rolling bent grass greens are spectacular and similar to those that the world’s top professionals encounter on the United States Tour. There are 72 bunkers to contend with and seven water hazards offering all handicap golfers a challenge yet the good golf shot will always be rewarded. ROODEPOORT MUSEUM The Museum, from an original collection started in 1963, is housed in the Roodepoort Civic Centre building in the centre of the city. The Roodepoort Museum is in Christiaan de Wet Road and is a popular venue for school tours. It is open Tuesdays to Fridays from 9.30am to 4.30pm, and Sundays from 2pm to 5pm. Phone the Museum on 011-761-0225 for more details. PICNIC AREAS & HIKING TRAILS Roodekrans Picnic areas in Wilde Amandel Road is a very popular spot with high trees, a lapa and braai facilities, a big playground for the children, a small stream running through it and lots of lawn. The Pines Pleasure Resort is situated in the valley between Silverfields and Breaunanda. Picnic, swimming and hiking opportunities are only a few of the activities that the Resort offers your family. Tel: 011-955-3845.